The 35th international chess tournament in Mogliano Veneto this year did not feature strong grandmasters or international masters, but a pack of 24 local players of average strength around 2150. Still, it was a very hard-fought competition, with almost no game ending as a draw before all winning attempts had been tried. I scored a rather disappointing 2 points out of 5, losing two games -one of them undeservedly, for a performance rating is 2030, a bit less than what I believe is my current playing strength. Below I report my only win, against Enrico Danieli, an elo 2070 player. 1.d4 d5 2.Nc3 Bf5 3.e4?! White sacrifices a pawn for a rapid development. This idea is not new, but the setup (with the black Bf5) is uncommon. I think the idea is unsound, as with a few simple moves black gained the upper hand. 3....dxe4 would be even a bit stronger but it would lend itself to 4.f3 exf3 5.Nxf3 with a rapid white development. The idea of 3....Bxe4 is that after 4.Nxe4 dxe4 5.f3? would run into 5....e5! 6.Bc4 e6 7.Ne2 Bd6 8.Bg5 h6! The idea is to get ready to push g7-g5, freeing the knight, and holding on to the e4 pawn for as long as possible in view of Ne2-c3. By conceding a weakening of the kingside, black holds on to his e4 pawn. The kingside expansion fosters a long castling and Nd5-f4 manouver, establishing a stronghold in a critical square. 12.Bg3 Nbd5 13.Nxd5 exd5 14.0-0 0-0? Better would have been 14....Qe7, or 14....Bf4. Castling is premature, and it could have given white a chance to equalize with 15.f4!, e.g. 15....exf3 16.Qxf3 Bxg3 17.Qxg3 Ne4 18.Qh3, when white has compensation for the pawn. 15.c4?! c6 16.Be5 dxc4 17.Bxc4 Nd5?! Again a suboptimal move; better was the forced 17....Bxe5 18.dxe5 Qxd1 19.Raxd1 Ng4 20.e6. I discarded 17....Bxe5 because I could not see that black is fine here after 20....Kg7. Better was 18.Qc2 f5 19.Rad1 Qe7 20.Qb3 with compensation. The smoke has (temporarily!) cleared a bit. Black retains the extra pawn and the white attack on the kingside is not threatening anymore. An interesting idea, to bring the a1 rook on the kingside attack. Correctly fearing that on 24.... Rh6, as originally intended, 25.Rg3 would prevent the Ne2+ and Qh2 threats while forcing the rook back to g6, as 25....Kh7 26.Qxg5 Qxg5 27.Rxg5 Nd3 28.f3 Nxb2 29.Bb3 e3 30.Re5 the game is gearing towards a draw. Black now threatens f5 trapping the queen, so the next move is forced. What would you play next as black ? I chose 30....Nd3, which is good enough; however, there was a stronger possibility, connected with a very astute king attack. By now both players had only five minutes to complete the game (we played with 30 second increments, but in this complicated position they are nowhere sufficient!). The best move was 30....Rd2! with the probable following 31.Rxe4 Qf6 (threatening Nxh3+) 32.Rf1 Ne2+ 33.Kh2 Ng3!! 34.Kxg3 Qd6+ and black wins. Better was 31.R1e2 Qf4 but black is still winning. Should black take the Re1 now ? No!, as indeed white's attack would be very dangerous: 31....Nxe1? 32.Rxf7+ Kg6 33.Qg8+ Kh5 34.g3! Qh8 (already the only move) 35.Rf6! and white is better, as the only possibility for black is now 35....Nf3+ 36.Kg2 Rxf6 37.Qxh8+. Here black could have played 32....Rxf3 33.gxf3 Nxf2!, but the text is safe and strong too. A mistake. I should have simply taken the bishop, when after 33....Nxb3 the best white has is 34.Qg4 Nc5 and black wins, as 34.Rxg5? Qxg5 35.Rg3 Qxg3 36.fxg3 e3 is a massacre. With both clocks now near zero, and both players down to increments of 30 seconds per move (with forced notation of the moves), the quality of the moves rapidly deteriorates. What would you play as black here ? Again a bad move! Note, however, that the apparently better 34....Rxe3 would also not lead to an advantage, as after the more or less forced sequence 35.Rxg5+ Qxg5 36.hxg5 Re1+ 37.Kh2 Rxf2, white has 38.Qxc6 and the game is even. The only option to retain an advantage was 34....Rg6, with the following sequence: 35.Rxd3 exd3 36.hxg5 and now everything draws because white has the strong threat Rh3. The only winning attempt is 36....Qxg3! (getting rid of the attacker!) 37.fxg3 Nxb3 (getting rid of the defender of the d1 square) and now 37.Qd8 d2 38.Qd3 Rxg5! 39.Qxb3 Rc5! and the rook prevails on the queen! Needless to say, seeing all of this with a minute or so on the clock would have been close to impossible also for a grandmaster, let alone a player like me... But it is interesting to see how narrow was the path to a win in this position, due to my mistake on the 33rd move. It is white's turn to falter. 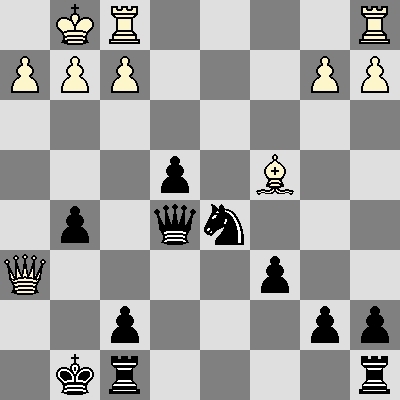 A draw was possible by playing 35.hxg5, again with the idea of Rh3. Finally the strongest, securing a win. The last black's move is not even the tenth best, but it still wins at this point! The winning path has broadened again. 38.Qe7 Nc5 39.Rxe4 Nxe4?! (better 39...Rxg3) 40.Qxe4?! (better Rxd3) Rd1+ 41.Rh2 Qe5! The last move is the strongest, and forced white to resign. A hard-fought game!